A Rohingya refugee woman is helped from a boat as she arrives exhausted on the Bangladesh side of the Naf River at Shah Porir Dwip after fleeing her village in Myanmar, on October 1, 2017 in Cox's Bazar, Bangladesh. More than 600,000 Rohingya refugees flooded into Bangladesh to flee an offensive by Myanmar’s military that the United Nations has called “a textbook example of ethnic cleansing”. 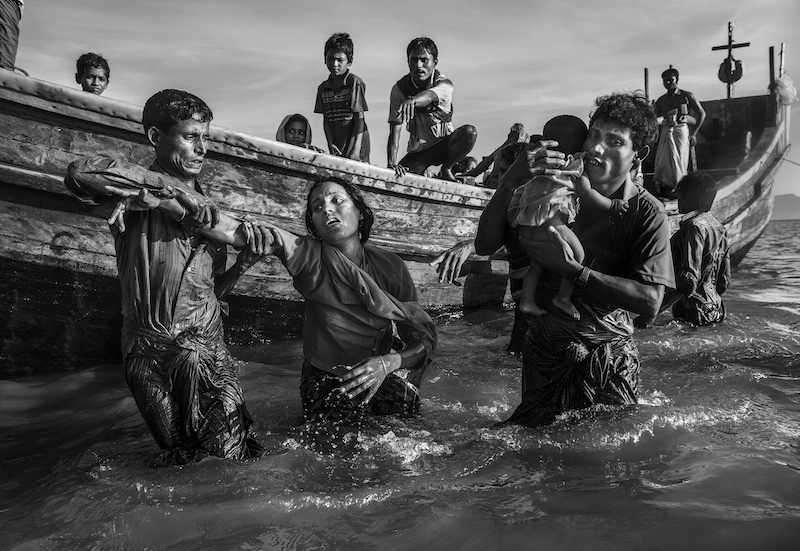 The refugee population is expected to swell further, with more Rohingya Muslims said to be making the perilous journey on foot toward the border, or paying smugglers to take them across by water in wooden boats. Hundreds are known to have died trying to escape, and survivors arrive with horrifying accounts of villages burned, women raped, and scores killed in the “clearance operations” by Myanmar’s army and Buddhist mobs that were sparked by militant attacks on security posts in Rakhine state on August 25, 2017. What the Rohingya refugees flee to is a different kind of suffering in sprawling makeshift camps rife with fears of malnutrition, cholera, and other diseases. Aid organizations are struggling to keep pace with the scale of need and the staggering number of them — an estimated 60 percent — who are children arriving alone. Bangladesh, whose acceptance of the refugees has been praised by humanitarian officials for saving lives, has urged the creation of an internationally-recognized “safe zone” where refugees can return, though Rohingya Muslims have long been persecuted in predominantly Buddhist Myanmar. World leaders are still debating how to confront the country and its de facto leader, Aung San Suu Kyi, a Nobel Peace Prize laureate who championed democracy, but now appears unable or unwilling to stop the army’s brutal crackdown.